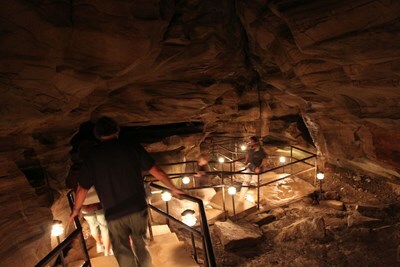 Laurel Caverns, formerly known as Dulaney's Cave and Laurel Hill Cave, is the largest cave in Pennsylvania. Located in Farmington, Pennsylvania; it sits on Chestnut Ridge near Uniontown, about 50 miles (80 km) southeast of Pittsburgh. Laurel Caverns is a privately-owned show cave with a three hour-long guided tour penetrating 46 stories deep into the mountain interior. This description uses material from the Wikipedia article on Laurel Caverns and is licensed under the Creative Commons Attribution-ShareAlike License (view authors).